The Professional Framing Company has been established since 1986. 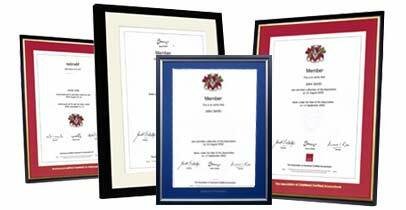 During the last 30 years we have manufactured and supplied over 500,000 hand-made certificate frames to professional people both in the UK and overseas. Accounting, architecture and design, business, engineering, IT, law, medicine and science - whatever your professional qualification, The Professional Framing Company can supply a frame that will have been exclusively designed in conjunction with your institute or association. We look to provide you with a high quality customised frame and first class service at a competitive price. You do not have to part with your certificate. Your frame is designed to allow you to easily insert and if necessary remove your certificate. If you have any queries please do contact us to discuss.